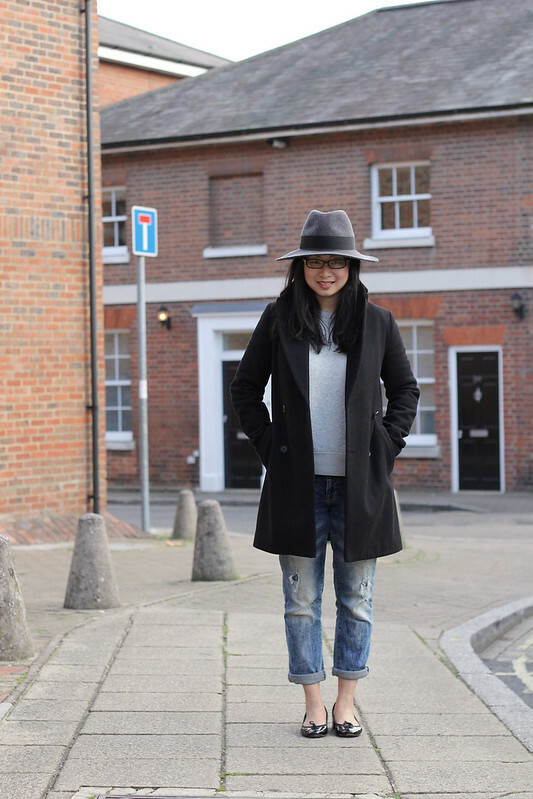 Outfit: Zara coat, Isabel Marant x H&M sweatshirt (similar here with code GIMMEMORE 30% off), Zara boyfriend jeans, Repetto Camille pumps, Christys hat. If I could live in sweats all year long, I would. Oh wait, I'm already doing that....... (shamefaced). You'll notice that this is NOT a specifically fashion blog or else I would have to use a sharpie pen and write a FAIL on my forehead. The singularly most in demand item from the Isabel Marant pour H&M was the grey sweatshirt. Yes, it's boring, grey like the English sky and completely under-rated. It's the one item that's worn more than my fancy schmancy Chanel jacket that I'm so proud of. I tried pairing the sweatshirt with the flirty ruffled silk skirt from the same collection and the result was good. Except that I nearly suffered frostbite trying to take a shot in subzero temperature. In the end, I decided to go for the most obvious look which is what I wear everyday anyway and save my two important limbs from potential amputation. How do you wear yours? Any other ideas? Do share yours in the comment field. By the way, I've included the Cyber Monday voucher codes to shave off additional discounts if you're planning on shopping. I really really like sweaters they can be so chic but it's very hard to find ones that fit perfectly (a bit loose yet must remain elegant)! Boy, do I know what you mean. I've tried on dozens of sweatshirts. The sleeves are voluminous which makes me look like I've put on a million kilos. The trick is to find ones that have narrower armholes and sleeves. So far, the only ones that seem to do this tend to be French brands - Isabel Marant, The Kooples, Maje and (okay, he's not French) Markus Lupfer. Exactly! I often try on sweatshirts that have either puffy sleeves (making me look like Anne Shirley) or are too short. Being French I know quite well the brands you mention (I would add Bash as well) but I have to say that in most cases the quality does not justify the price. However I saw that Helmut Lang had great sweatshirts but I will wait for sales to buy one as they are quite pricey. It's really a pity that nice and simple sweatshirts are usually very expensive! LOL! Yes, I know what you mean. I don't like ones that are too cropped. Baring midriff isn't my kind of thing. I've tried on ones that have rough lining. I prefer brushed cotton ones too. You're right. The best ones are pricey! You should give Markus Lupfer a try. The cut is immaculate. I'll have to try it too with this combination. You make it sound so feminine and chic! i love the way you've worn it actually, though i think i might have gone for longer jeans (i'm a total wimp when it comes to the cold!) - a statement necklace would look great with this too. i think you would pull it off perfectly! I have so many statement necklaces that have never seen the daylight. Shame on me! I like to wear mine with a leather skirt, with the collar of my blouse just peeking out. I'm going to try that but with a pair of pants. I don't have a leather skirt at the moment. Thanks for the inspiration! Ooooh...skater skirts. I haven't thought of that. have the same bag. girl. why dont u do outift POSTS more often?!!?!!! U are so flawless! xO! Yup, that's the coat. I got the one in XS. I like that you kept it real without all the fancy stuff. And the skirt is cute - I didn't even look at that - it passed me by totally. And your coat is an XS! I could barely get in the Small! I am a sucker for grey sweaters and ever since you posted this one with that great review I've wanted one from the Isabel Marant pour H&M. Thank God I managed to order one this morning online, I guess there were a lot of returns. I hope I have the right size, 'cause it looks pretty perfect on you! I'm glad you're thinking of keeping all limbs. They definiteluy come in useful :) I think you absolutely went for the right one. Much more classic, long term wearable and perfect for your chic style! Love this look. Very casual chic!